If your puppy is to grow into a healthy adult dog, it is essential that you feed them a high-quality puppy food. That doesn't mean spending hundreds of dollars on the most expensive puppy formula money can buy; it simply means doing a little bit of research to find the recipe most likely to give your newborn best friend the nutrients and nourishment required to go from puppyhood to adulthood without incident. Today, we’re going to be looking at some of the most reliable puppy foods on the market, guaranteed to help your puppy – and bank balance – grow. Why should I avoid corn? Why should I choose a dry formula? Will dry food damage my puppy’s teeth? 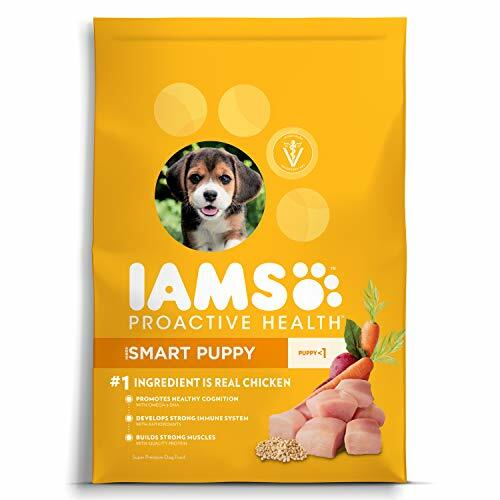 IAMS rather confidently proclaims that its Proactive Health Smart Puppy will become your puppy’s favorite food the moment they take their first mouthful of it. It’s a bold statement to make, that’s for sure, but not one that is entirely unjustified. Dog owners have long been singing the praises of IAMS as a brand and the Proactive Health Smart Puppy formula is one of its most popular recipes. While this recipe does include chicken by-product meal, it uses real pieces of chicken as its main ingredient, so you can be certain your puppy’s animal protein is coming from genuine chunks of meat that are as rich in flavor as they are in nutritional value. For a newborn pup, even the most seemingly inconsequential of illnesses can prove fatal, which is why it’s essential you give them a diet that is loaded with antioxidants as soon as they are ready for solid food. IAMS Proactive Health Smart Puppy fits that bill and then some. Enriched with antioxidants, this formula will immediately strengthen your puppy’s immune system and will lay the groundwork for consistent good health throughout their life. Docosahexaenoic acid (DHA) is an omega-3 fatty acid that contributes to the healthy development of the brain and eyes. IAMS Proactive Health Smart Puppy is particularly high in DHA, so those who typically have trouble training their dogs should pay careful attention to it. IAMS is a veteran of the dog food industry and so understands that different breeds have different dietary requires. In order to ensure puppies of all breeds can enjoy the benefits of a bowl of its Proactive Health Smart Puppy, IAMS offers a series of carefully crafted editions of the formula, including Medium Breed and Large Breed. More and more dog owners are turning to grain-free formulas to feed their pets as recipes that are high in grain have been known to cause digestive issues in canines. 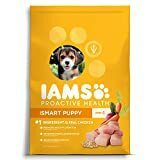 IAMS Proactive Health Smart Puppy has, unfortunately, a high grain content, which is why we docked it half a star in the above comparison chart, leaving it just shy of a five-star rating. Merrick’s Grain-Free Puppy Real Chicken + Sweet Potato Recipe is designed to be consumed by all breeds, so it’s a great choice for dog owners who must feed puppies of two or more different breeds. However, it will also appeal to those raising just one puppy. Read on to find out why. Merrick Grain-Free Puppy Real Chicken + Sweet Potato Recipe is packed with omega fatty acids. With a recipe that includes both omega-3 and omega-6 fatty acids, this formula promises to protect your puppy’s skin against infections while its coat comes in. Once your dog’s coat has fully developed, the high levels of omega fatty acids present in this formula will ensure it shines its brightest. Merrick Grain-Free Puppy Real Chicken + Sweet Potato Recipe contains leading levels of glucosamine and chondroitin. Together, glucosamine and chondroitin promote optimal skeletal growth and ensure healthy hips and joints throughout adulthood and beyond. This makes this formula a great choice for large breed puppies, as large dogs are more at risk of developing joint pain and arthritis than their small and medium counterparts. In the previous entry, we examined the damaging effects that grain-based dog food can have on the digestive systems of newborn pups. As you likely guessed from the name, Merrick Grain-Free Puppy Real Chicken + Sweet Potato Recipe contains no grains and instead relies on vegetables, such as sweet potatoes and blueberries, as its primary source of carbohydrates. 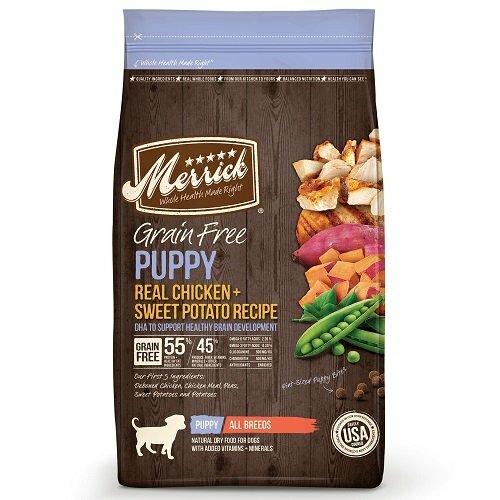 Merrick manufactures all units of its Grain-Free Puppy Real Chicken + Sweet Potato Recipe in the United States of America. The advantages of this go far beyond the realms of national pride (although it is nice to know you can feed your dog while simultaneously stimulating the American economy). Many brands of dog food outsource the production of their formulas to China, where health and safety regulations are less strictly adhered to. Such brands use subpar ingredients in order to cut costs, which means the dogs who consume their formulas receive less nutrients than they would from those of brands who manufacture their products in the United States. 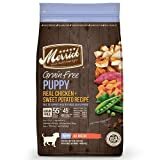 Grain-Free Puppy Real Chicken + Sweet Potato Recipe is a great formula, there’s no denying that, but Merrick could benefit from reevaluating how it packages it. Many puppy owners who have purchased this formula online have complained about receiving it in damaged, and sometimes even torn, bags, causing the loss of kibble. Even after decades in the industry, Wellness remains at the forefront of dog food innovation and is one of the most popular brands of premium formulas among owners of puppies and adult dogs alike. There is a Wellness formula for every stage of your dog’s life and you can start things off right with Wellness CORE Deboned Chicken, Chicken Meal & Turkey Meal Recipes. A dog will never require more protein in its life than it will during its puppy years. Your dog’s muscles will remain in development throughout puppyhood, which is why you should be sure to feed them a formula that is high in protein. 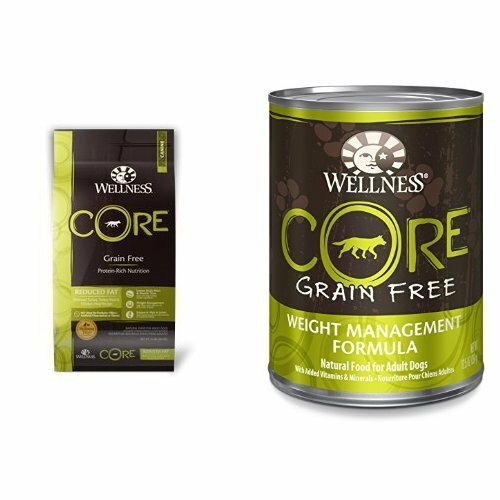 Wellness CORE Deboned Chicken, Chicken Meal & Turkey Recipe boasts multi-meat protein and contains 80% more meat than the typical dog food formula. Like the IAMS formula that started off this list, Wellness CORE Deboned Chicken, Chicken Meal & Turkey Meal is high in DHA. Derived, in this case, from fish oil, DHA will make your puppy more attentive and easier to train and will prevent cognitive deterioration in old age. Protein Focused: Core 100% Natural Food And Treats Is A Nutrient-Dense, Balanced Diet Formulated With Meat, More Meat And Real Vegetables. Wellness CORE Deboned Chicken, Chicken Meal & Turkey Meal is made from all-natural ingredients and contains no artificial colors, flavors, or preservatives. Similarly, this formula is entirely devoid of soy, wheat, and corn, which offer no nutritional value and are commonly used as filler ingredients by dog food manufactures. Puppies have trouble chewing formulas with large kibble as their teeth and jaws aren’t yet strong enough to break it down. 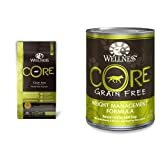 Wellness CORE Deboned Chicken, Chicken Meal & Turkey Meal, features specially-designed small kibble so as not to aggravate your puppy’s gums or damage its teeth. When it comes to nutrition, Wellness CORE Deboned Chicken, Chicken Meal & Turkey is pretty solid. In the taste department, however, it seems to be somewhat lacking. Some who have purchased this formula have described their puppies rejecting it due to its taste, which, if it happens to you and your puppy, will complicate the weaning process tenfold. “Puppy chow” may sound like a euphemism for an unappetizing meal, but if the reviews are to be believed, Purina’s Puppy Chow Natural Plus Vitamins & Minerals formula is anything but that. Through its affordable yet nutritious recipes, Purina has established itself as a favorite of dog owners across the world and Puppy Chow Natural Plus Vitamins & Minerals serves to further cement the brand’s place at the top of the dog food industry. When feeding a puppy, it is essential that you use a formula that provides the correct combination of the necessary nutrients, although finding one can prove more than a little tricky. Over the years, Purina has perfected its formulas to guarantee 100% balanced nutrition, so you can be certain your puppy is getting everything they need from Puppy Chow Natural Plus Vitamins & Minerals when it is served in accordance with their size and weight. Purina Puppy Chow Natural Plus Vitamins & Minerals contains several ingredients that are high in antioxidants. These antioxidants serve to strengthen the immune system when consumed in large quantities, so your puppy won’t be at risk of falling ill with an otherwise avoidable infection. While puppy food should be easy to chew and swallow, many manufacturers go too far and fill their bags with soft kibble that is almost grape-like in texture. Soft kibble does nothing to strengthen your puppy’s jaws, so they will have trouble navigating adult kibble when it is finally introduced to their diet. 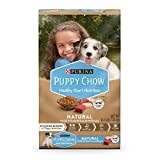 Purina Puppy Chow Natural Plus Vitamins & Minerals features kibble that is crunchy yet easy to swallow, so your puppy will get lots of chewing practice without the risk of choking. Purina Puppy Chow Natural Plus Vitamins & Minerals is an all-natural formula and is made from real pieces of farm-raised chicken. On top of that, it contains no artificial flavors, colors, or preservatives, so you don’t have to worry about damaging your puppy’s delicate system with potentially harmful chemicals. When it comes to the quality of the ingredients used, Purina Puppy Chow Natural Plus Vitamins & Minerals is arguably the most disappointing of all the formulas featured in this article. While it does include real farm-raised chicken, it also includes chicken by-product meal, which most veterinarians advise against. To make matters worse, this formula contains a number of filler ingredients, including corn and corn gluten meal. There’s a reason the entire Western world loses its collective mind each autumn when Starbucks brings back its Pumpkin Spice Latte and that reason is pumpkin is absolutely delicious. With this formula, Nature’s Recipe has made that same great pumpkin taste available to canines, blending it with a unique combination of vitamins and minerals to keep your puppy smiling into adulthood. With pieces of real chicken complimented by peas, this formula is high in both animal and plant protein. Its high protein content makes Nature’s Recipe Puppy Chicken, Sweet Potato & Pumpkin Recipe the ideal food for active puppies and small breeds. As well as the aforementioned pieces of real chicken, Nature’s Recipe Puppy Chicken, Sweet Potato & Pumpkin Recipe includes, as you likely guessed from the name, pieces of real sweet potato and pumpkin. Together, the sweet potato and pumpkin act as a rich source of carbohydrates, easing the digestion process and minimizing the risk of constipation, diarrhea, and bloating. Nature’s Recipe Puppy Chicken, Sweet Potato & Pumpkin is another grain-free formula and won’t cause or contribute to any problems with your puppy’s digestive system. The extra carbohydrates and fiber provided by the sweet potato and pumpkin combo from which the formula takes its name promises to keep your puppy regular. Unless you have your puppy tested the moment it’s born, it’s difficult to know exactly what they are allergic to or intolerant of, so you should search for a formula with the fewest number of potentially aggravating ingredients. Many puppies find it difficult to digest corn and beef, which is why Nature’s Recipe makes a conscious effort to avoid both ingredients in its puppy formulas. Some puppy owners have reported Nature’s Recipe Puppy Chicken, Sweet Potato & Pumpkin causing consistently soft stool, which is likely a result of the extra dose of fiber in the formula. There are a number of things you should keep in mind when searching for the dog food formula that is right for your puppy. You should always be conscious of the breed you are buying for as the different dietary requirements of each breed manifest themselves as soon as they are ready for solid food. Certain puppy food manufacturers offer formulas geared specifically towards small breeds or large breeds, so be sure to check the packaging of each potential purchase for such a classification before making up your mind. Be sure to feed less active large breeds formulas with a low percentage of protein so as to lower the risk of unnecessary weight gain. Be mindful of the number of puppies you will be feeding with your chosen formula. If you must feed an entire litter, it is advisable to purchase the largest bag of food you can find, which will cost you a little extra but will ultimately save you money in the long run. If you are feeding a single puppy, you can get away with buying smaller pouches of your chosen formula, but just make sure you have enough to see you and your puppy through to your next shopping trip. A regular feeding schedule is key to a dog’s growth and discipline. A decent puppy food formula should have a high protein percentage. Dogs develop rapidly during their first six months out of the womb, so you have a duty to ensure your puppy gets the protein required for optimal growth. In dog food, protein generally comes from meat and vegetables and so we advise searching for a formula that has a balanced serving of both. An illness that would be little more than a minor inconvenience for an adult dog could be fatal for a newborn pup. In order to avoid the unthinkable, you should seek to feed your puppy a formula that will contribute to the development of its immune system. The immune system is strengthened by the consumption of natural antioxidants such as citric acid, vitamin C, and vitamin E.
Although some premium manufacturers of dog food use small amounts of by-product meal in their formulas, it is advisable to avoid dog food recipes that rely on by-product meal as their primary ingredient. After a meat factory has harvested the tangible parts of an animal (i.e. the wings and breast of a chicken), the less appealing parts that are left behind are ground into a paste and turned into by-product meal. By-product meal can contain anything from hooves to tails and has minimal nutritional value. While corn does indeed qualify as a vegetable, dogs have quite a bit less to gain from it than humans do. Corn doesn’t have a whole lot to offer the canine body and is generally used only as a filler ingredient by dog food manufacturers who want to keep costs down. Furthermore, if corn is present in a dog food formula, it’s a safe bet that the recipe contains other filler ingredients and should be avoided. The majority of dog food formulas we include in our reviews are dry dog food formulas and that isn’t a coincidence. Dry dog food has a number of advantages over wet dog food. For example, dry dog food has a longer shelf life than its wet counterpart and is a great deal easier to clean up, which makes it the ideal choice if you feed your dog indoors. Furthermore, dry dog food is significantly less expensive than wet dog food and won’t push you over budget if you are trying to minimize the amount of money you spend. A lot of puppy owners go with wet food as they erroneously believe dry food will damage their dog’s teeth. In reality, wet food sticks to a dog’s teeth more than dry food does, which means you’ll have to introduce a rigorous brushing routine if you are to feed your puppy a wet formula without causing them dental issues in the long run. It can be difficult to know at which point you should move your dog from a puppy formula to an adult alternative as different breeds mature at different rates. As a rule of thumb, you should keep your dog on a puppy formula for the first year of its life, but some dog owners find themselves switching up as early as nine months. In the end, it will come down to the speed of your dog’s growth and development. All dogs develop differently, which is why it is impossible for us to name any of the puppy foods featured in this article as the absolute best puppy food on the market. That being said, Wellness CORE Deboned Chicken, Chicken Meal & Turkey Meal Recipe seems to be the most popular and the number of pet owners raising their puppies on the formula seems to double every day. With its multi-meat protein and high fiber content, Wellness CORE Deboned Chicken, Chicken Meal & Turkey Meal will ensure your puppy develops into an energetic adult dog and remains so throughout its life. Nature’s Recipe Puppy Chicken, Sweet Potato & Pumpkin Recipe should also be placed near the top of your shopping list, particularly if you have a large breed dog that doesn’t require the copious levels of energy promised by the multi-meat formula of the aforementioned Wellness option. With chicken for the growth of muscle and sweet potato and pumpkin for regular functioning of the bowels, this Nature’s Recipe formula is certain to get your dog’s life off on the right paw!